Ever wonder what that pianist or bassist or drummer was really thinking on stage? What concept or inspiration spurred that composition? Since 1994, Anil Prasad has delved into the minds of a deep pool of musicians through a series of insightful conversations which form the basis of his website, Innverviews, the longest-running online music magazine. 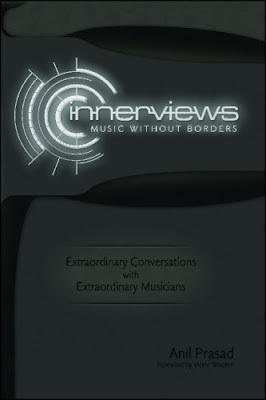 Now Prasad has compiled two dozen of his conversations in one print volume, Innerviews: Music Without Borders, published this fall by Abstract Logix Books. Anyone interested in the art and mind of musical genius will find fascinating revelations here, be it from the world of rock, pop, folk, jazz or anything in-between or fused together. In fact, many of the artists that Prasad interviews defy simple classification, which is a large part of the fascination of Innerviews. Prasad’s subjects have ranged from Bjork and Tangerine Dream’s Edgar Froese to Stanley Clarke and McCoy Tyner, from hip hopper Chuck D to the duo of John McLaughlin and Zakir Hussein, from Ani DeFranco to Leo Koettke. His questions eschew the usual interview format which mine biographical details, early influence, current preferences, etc., and instead probe specifics that give readers insight into artistic concepts and challenges. He asks drummer Bill Bruford about his collaboration with Ralph Towner and Eddie Gomez on their recording, If Summer Had Its Ghosts. Why these partners, how does a drummer approach melodic composition? He asks Stanley Clarke about the status of bass guitar and his recent shift to acoustic bass. He asks Chuck D to describe his creative process, Ani DiFranco to describe her development of percussive fingerpicking, Bela Fleck to describe his approach to bandleading. Faced with an interviewer who probes beneath the surface, the musicians respond with a candor seldom found on the pages (or webpages) of typical music magazines. There are many collections of interviews with musicians. Anil Prasad offers more than Q and A. He gives his subjects an opportunity to reflect on their philosophies, their challenges, their triumphs, and in doing so gives readers an opportunity to go beyond the notes and melodies. And that kind of accessibility brings us closer to Tyner’s notion of community.